Mojoe Grooming kit made with safe designs, and from safe silicone& polyethylene. 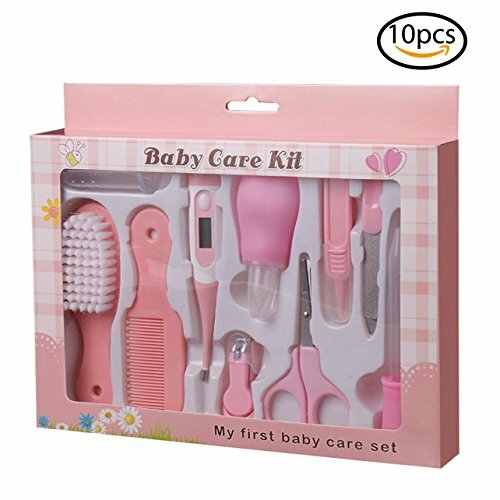 Essential 10 pieces cover your needs for the first year as anew parent, including a thermometer, hairbrush, hair comb, nail clippers, nailscissors, nasal aspirator, nose cleaning tweezers, medicine dropper, nail fileand finger brush (Gum massager). Details specially designed for maximum care – round-tipscissors, non-scratch comb, anti-slip clippers and stainless-steel scissors. Suitable gift for first time moms & baby first aid kit.